Amid all the AAA exclusives and fancy new controllers, Microsoft also took a moment to boast about the groovy indie games coming to Xbox One. They’re coming to PC as well, so you can take a gander at the trailers below, comforted by the fact that you don’t need a console to play them. Fullbright’s Steve Gaynor took the stage at the Microsoft E3 press conference to reveal the first full trailer for his company’s new game, Tacoma. Explaining that Fullbright “wanted to push themselves” with their follow-up to the award-winning Gone Home, he showed how Tacoma is set in a remote space station, and will try to bring to life an unfamiliar and alien setting. It’s a pretty impressive trailer. It even looks like we might finally have a derelict space station game where you deal with low-gravity. Tacoma is due out in 2016. 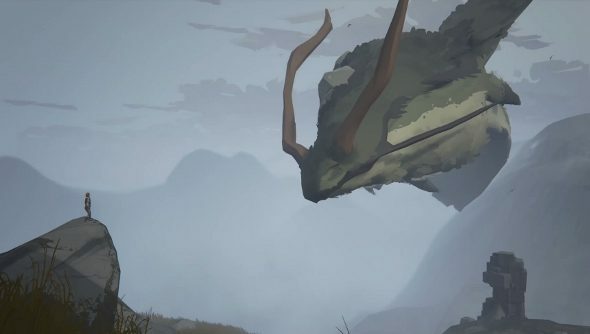 Ashen might be a sort of post-apocalyptic fantasy RPG, where the light of the sun has been snuffed out by volcanic ash, where life is fleeting and giant monsters prowl, but amid all that doom and gloom is a game about forging relationships. Players can find other survivors and choose to guide them back to their camp, where they can remain and work together to keep on keepin’ on. Beyond Eyes is a blank canvas that’s slowly filled with colour and life as you explore it. Players must guide a blind girl through the gorgeous world, filling it in through her other senses, while also making her face her fears. “The world outside is frightening and unfamiliar but, with the guidance of the player, Rae learns to overcome her fears and finds beauty and possible new friends outside of her golden cage,” said developer Tiger Squid. It’s due out this year. I’ve been head over heels in love with Cuphead since a trailer was shown off at E3 2014. It’s a run and gun action game blessed with some of absolutely gorgeous art and animation inspired by 1930s cartoons. In it, you play the eponymous Cuphead, working through 2D levels in an effort to defeat bosses and earn enough to pay back a debt to the pesky Devil. The game’s been pushed back quite a few times, and was meant to be launch this year, but lamentably it’s been pushed back to 2016.